The Taking Flight with DISC training program is a high energy training experience where individuals learn about themselvesand others. This is not your typical DISC session. Taking Flight with DISC has literally written the book on the DISC styles and reinvented DISC training. Why birds instead of letters? By linking the DISC styles to four birds, the Taking Flight with DISC program breathes new life into the tried and true DISC model. 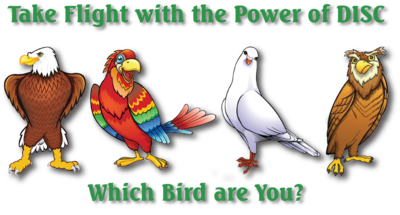 First introduced by Merrick Rosenberg in his book, Taking Flight!, the birds add colorful energy and help create a memorable session for participants. By linking Eagles to the Dominant (D) style, Parrots to the Interactive (I) style, Doves to the Supportive (S) style and Owls to the Conscientious (C) style, people remember the styles like never before. And if people are going to apply new wisdom, they have to remember it! A year from now, when people are asking questions like, "What does the D stand for?" they will still recall that eagle's personality is direct, decisive, daring, and driven. Quite simply, letters are not memorable, birds are. Just looking at the letter D does not intuitively reveal behavioural traits like bold, direct, and results-oriented. But thinking about an eagle immediately brings these personality traits to mind. Participants can easily ascribe characteristics that capture the essence of each style to eagles, parrots, doves and owls. The "stickiness" of the birds allows participants to instantly connect with what they represent and remember them for the long-term one. "Some people are skeptical when we flash the birds to start a DISC session. That skepticism lasts all of three minutes before participants are fully engaged, laughing, enjoying themselves, but most importantlylearning! I've never seen such an engaging approach to DISC that is so easily applied back on the job and talked about by employees months later. I can't remember my DISC world pre-birds!" What is the impact of Taking Flight with DISC Training? We all know that employees who are self-aware are more likely to maximise their talents, more effectively recognise and manage their challenges, and produce better results. Self-aware employees work better with their colleagues and promote teamwork at every level of your organisation. In return, your company experiences higher morale, lower turnover, and better results. Every employee, whether they realise it or not (and most do not), is a co-creator of workplace culture. When people understand their own personality and behavioural style and show respect for individual differences, they impact the culture in a very positive way. By applying the wisdom of the styles, each person improves the culture, one interaction at a time. Besides the birds, what makes this DISC training program different? Most DISC sessions generate a high level of engagement because if there's one topic people like to learn about, it's themselves. But the big question three months later is, "Did the DISC training change people's behaviours?" And maybe more importantly, "Did the training generate a good return-on-investment for the organisation?" Most DISC training programs are designed to teach people the DISC model and help them understand their report and their personality. They do not, however, create new behaviours that help individuals build stronger relationships and drive better results. Instead of focusing on letters, the Taking Flight with DISC program targets the development of new skills. We focus on application, not on a model that will soon be forgotten. This session builds upon the key skills needed by all employees, such as: communicating, listening, providing feedback, managing stress, dealing with change and managing time. By building on existing knowledge, we utilise a brain-friendly approach to learning that makes new insights immediately accessible in the moment they are needed. There's an expression in neuroscience, what wires together fires together. The Taking Flight with DISC session wires DISC to existing knowledge and thus it fires at just the right time. The Taking Flight with DISC training program is filled with laughter and learning from beginning to end. We use activities that reflect what people see in their daily life, and get participants to describe their experience with these topics to show how the styles relate to each other. Forget just turning to a partner to discuss and report out, this is a level of interaction you have never seen before. The training program can be conducted as either a half or full-day. The half-day program includes an introduction to the four styles, engaging activities to see the styles in action, linking the four styles to core skills needed by all employees, exercises to develop people-reading skills, and action planning. The full-day session expands the insights to include core principles of applying the styles in action, team dynamics using DISC, and a deeper understanding of how the styles react under stress and pressure. This is great! Can I become a DISC trainer? Yes! As a leading authority on DISC we offer DISC certification courses several times a year in various cities throughout Australia, New Zealand, South-East Asia and the Middle East. These word-class materials are in demand, and in a one-day session, you will gain the skills you need to let your own training sessions Take Flight! This session enables team members to harness the power of behavioural style awareness in fostering effective teamwork. Each person will complete his or her own behavioral profile and receive a group report that describes overall team strengths and potential blind spots. What emerges is how your team is likely to handle team dynamics like deadline pressure, risk taking, time management, delegation, and stress. Perhaps your team configuration is strong on strategy and vision, but lack behavioural styles who focus on processes and systems that ensure results. Maybe your team excels at execution, but lacks the communication skills to ensure other parts of the organisation are aware and capitalising on your success. Through dynamic interactive exercises, participants experience their styles as they play-out in a variety of team situations, and have the opportunity to adjust behaviors to improve individual and team effectiveness. Fun, powerful, and immediately applicable in the workplace, this program provides the foundation for building trust and achieving high performance. No matter what your business objective, the foundation of effective leadership is grounded in understanding oneself, recognising how your particular style impacts others, and bridging the two to achieve shared results. Taking Flight! utilises the DISC Model to reveal a profile of each leader's behavior. Beyond simply understanding styles, this engaging session takes participants through many aspects of enhancing performance improvement: How do each of the styles respond under stress, to taking risks and managing conflict? How can tweaking your listening, delegation, and feedback skills accelerate effective communication and drive outstanding team performance? Through dynamic interactive exercises, participants experience their styles as they play-out in a variety of situations, and have the opportunity to adjust behaviours to improve their own leadership skills. Participants will discover the hidden genius of each DISC style and how they can best be utilised from a leadership perspective. Learning how to adapt to the right style and the right time with the right person all without sacrificing one's own perspective, will reveal new and effective strategies for handling a wide range of situations. These simple but profound behavioural shifts have the power to transform individual and team performance. Are you interested in facilitating world class DISC training programs? Perhaps you have been training in DISC for years and are open to fresh activities, new insights, and premium materials to add to your repertoire. Or, perhaps you are new to training or new to training with DISC. Becoming certified in Taking Flight with DISC will equip you with the skills, insights, and best practices to facilitate engaging, epiphany filled DISC training sessions. Because when participants are actively participating, the learning accelerates, light bulbs go off, and your impact soars. Our one day workshop will prepare you with expertlevel DISC knowledge and demonstrate why participants love learning the Taking Flight with DISC way. Learning about the history and theoretical foundation of the DISC personality and behavioural styles. Interpreting DISC profile graphs and reports. Understanding the four styles (D- Eagles, I - Parrots, S - Doves, C - Owls) and learning how to apply them in everyday situations. Integrating the Taking Flight birds into engaging DISC exercises to deepen the learning experience. Applying DISC in a variety of settings, including: coaching, conflict management, customer service training, leadership development, sales training, diversity training, recruitment, mediation, mentoring, new employee orientation, on-boarding, creating performance improvement plans, and team building. Utilising the fully-scripted Taking Flight Facilitator Guide to reinforce and master what you have learned in the facilitation process. Your ability to capture and galvanise participants with the power of DISC will be an electric experience that you will be able to repeat over and over again. No matter which DISC style profile you use, this program will enhance your strengths so that you can achieve maximum impact with your clients or employees. We are passionate about DISC because, done well, DISC changes lives. So join us in spreading the most meaningful insights and strategies DISC has to offer through Taking Flight with DISC training.